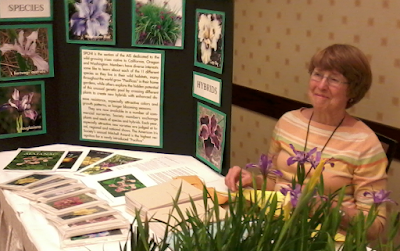 Longevity for plant-interest societies like Society for Pacific Coast Native Irises and other sections of AIS comes from the dedication of individual members. Every person who takes on an aspect of management or activities carries that part of the organization forward. We are looking for new ideas, new approaches, and of course, interested members, to help carry SPCNI and other iris societies that are part of AIS forward into the 21st century. SPCNI will be 50 years old in 2022, and we’d very much like to see it thriving. 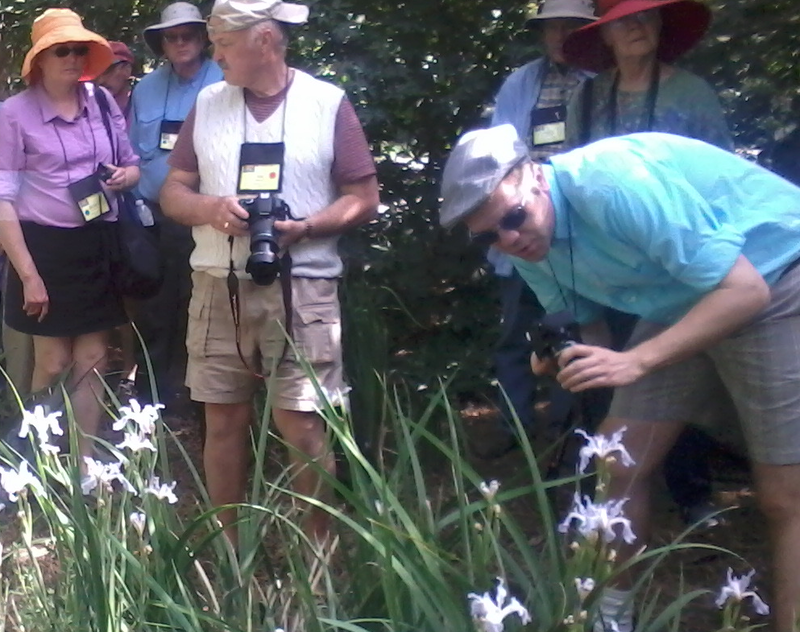 Eager photographers at Rancho Santa Ana, 2012, looking at I. munzii x plants, first studied by Dr. Lee Lenz, mid 20th century. In each paragraph below I comment on some aspect of running an organization that is foundering. I would like to hear from readers about each aspect, and I know other sections of AIS feel the same. Share your ideas! 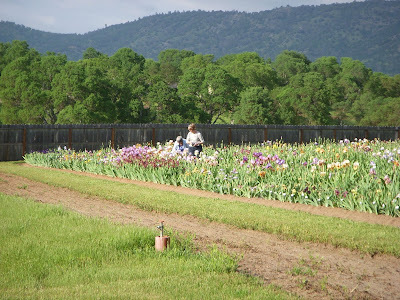 Interest in Irises: A tall bearded iris is the first flowering plant I saw up close and remembered. It was purple, with thick fleshy rhizomes that crept around in ophidian fashion, and as tall as I was. To a three-year-old, it was simply stunning. 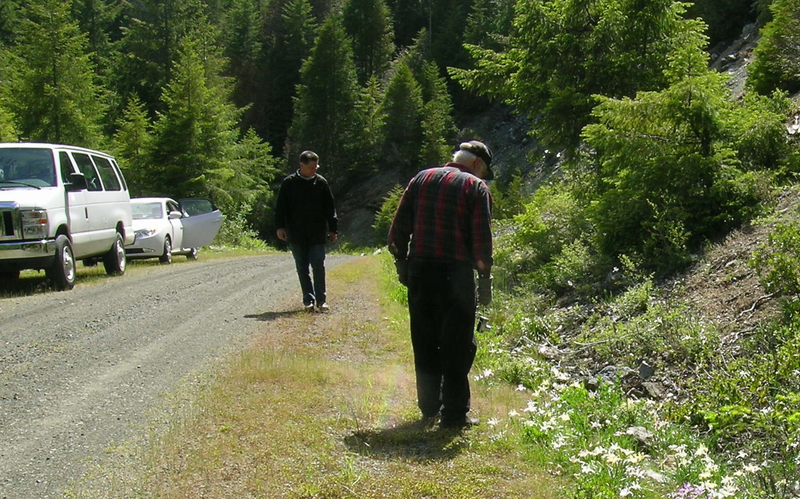 Decades later, with a garden of my own, I joined SPCNI, having become an ecologist, then developed a passion for native plants. This took a garden (it was my family’s yard), an old iris (my mom soon ripped it out, to my dismay), and of course, flowering plants. 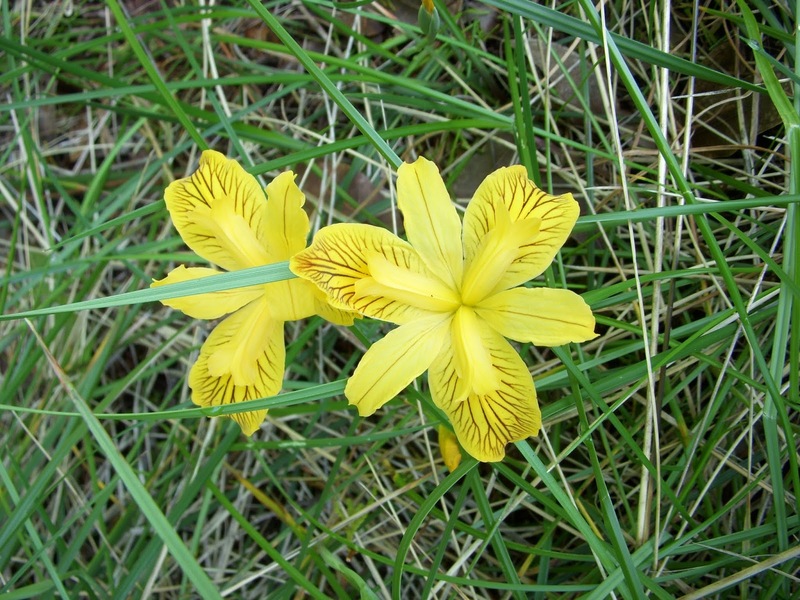 How do we promote species - species interactions between people and irises? The Pacifica Iris that led me to SPCNI: Iris innominata; these photos are from wild sites in southern Oregon, where it is native. Members: Membership is around 200 people. New members bring wonderful energy to organizations. 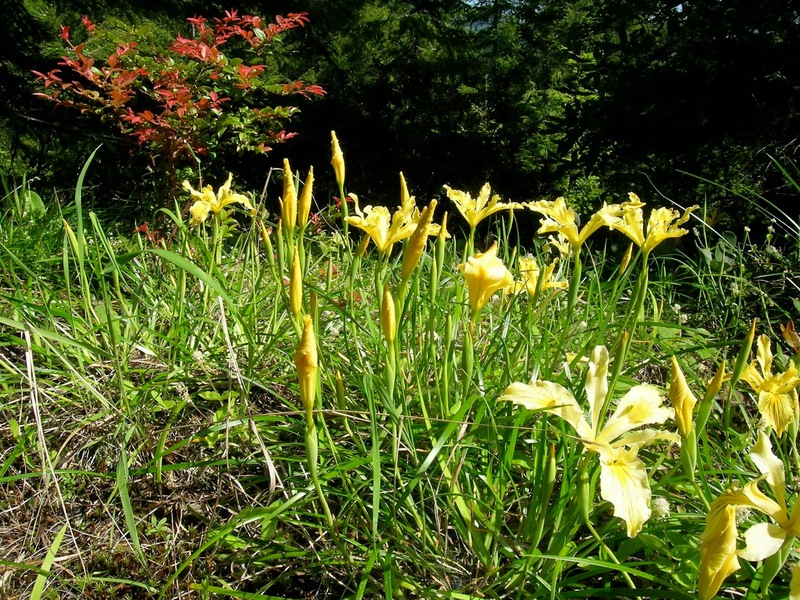 There is a resurgence of interest in gardening and food quality, so an interest in flowers, and especially irises, may come along soon. How should we encourage new memberships? Ditches full of Iris tenax x Iris innominata hybrids somewhere in southern Oregon on a field trip in 2010. Participation: The board has been in place for more than ten years with only one change, a new seed chair a few years ago. All our board members are ready for a change, and this means others are needed to fill their positions. How do we interest members in taking these positions? 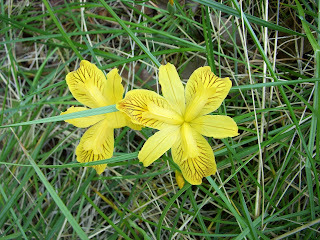 Print Issues of Publications: There is interest in Pacific Iris; I get the emails when issues are late or missed. We did a full color print issue as a special treat last fall, but no one commented on it afterwards. I’m still wondering if anyone noticed! An AIS member told me that all our issues should be full color, but I wonder how many get the issues just to look at the pictures? Debby Cole at Ontario 2012 AIS Convention; iris convenings are great ways to meet people from all over the continent. But PCIs only grow well on the West Coast. Editors and Content: SIGNA, Species Iris Group of North America, meanwhile is looking for content for their publication, and an editor; AIS is looking for articles. Our own editor is in the same boat. How do we encourage members to write and share images for publication? Seed Donations: There is interest in getting seeds, especially of new hybrids and stalwart old selections, but donors have dwindled to fewer than ten, and seed orders have dropped over the past few years to fewer than twenty-five, in part due to a drop in seed donations. It takes time and focus to produce selfed crosses or find wild plants, collect the pods, dry the seeds, and send them to the seed chair. The first time I cleaned seeds, I felt like I was connecting to long lost ancestors, carrying forward a skill that has served our people well for thousands of years; it was amazing. Would videos help promote interest in this ageless skill? How about promoting gardening, so that vital skills like crossing plants, growing new hybrids, selecting high quality plants, and planning future crosses are not lost? Would more videos help? How do we encourage seed saving? Joseph Ghio, prolific hybridizer, active in several sections of the genus Iris; here with Debby Cole looking over his seed bed, 2012. Sharing Information via Field Trips: There is also interest in field trips, though the last time we offered to organize a trip, no one came forward to say “I will attend.” In the past, these were several days of driving in the hills to see wild species. We are considering short, one-day trips to see a wild site, or a few gardens. Does this sound more attractive than longer trips? Display Gardens and Meetings: We all love seeing well grown display gardens of our favorite iris groups, especially new hybrids. These take years to develop and major donations of time and plant materials as well as growing space. They go hand in hand with AIS conventions. 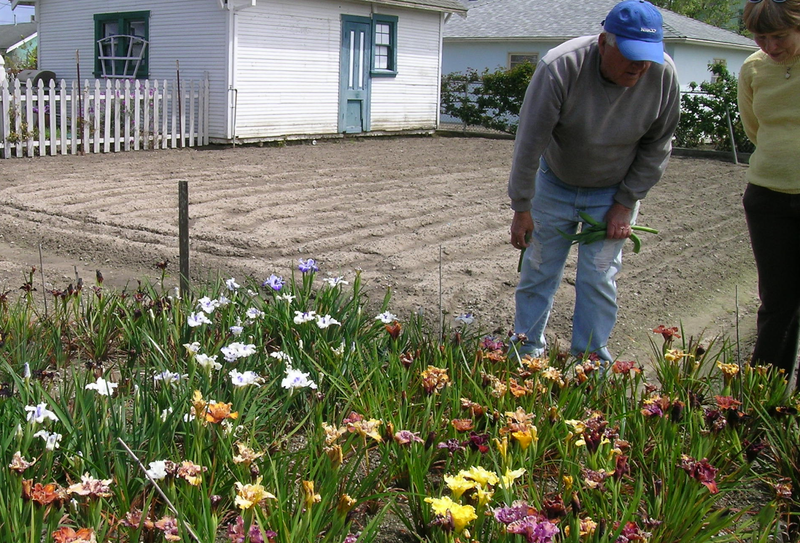 SPCNI can’t fully participate because Pacifica iris don’t grow, or grow well, away from the West Coast. Should we instead try virtual display gardens and meetings via video? Or try this: Send the virtual garden manager five shots of your newest hybrid, he’ll merge them in a collection to stream? How about video tours of amazing private gardens or botanic gardens? Please think about these topics, think about what you would like to see or do, and do post your ideas. We have some wonderful iris societies to energize! An important post that should be ready by all plant societies. I agree--and I'd like to see comments on new activities, digital sharing of gardens, etc, to try.